Today’s the big day for Apple shareholders. Here is a summary of some of the numbers I will be looking at. Analyst consensus estimates are around $1.23 per share under the new post-split share structure. Estimates seem to be for around $38 billion for the quarter. 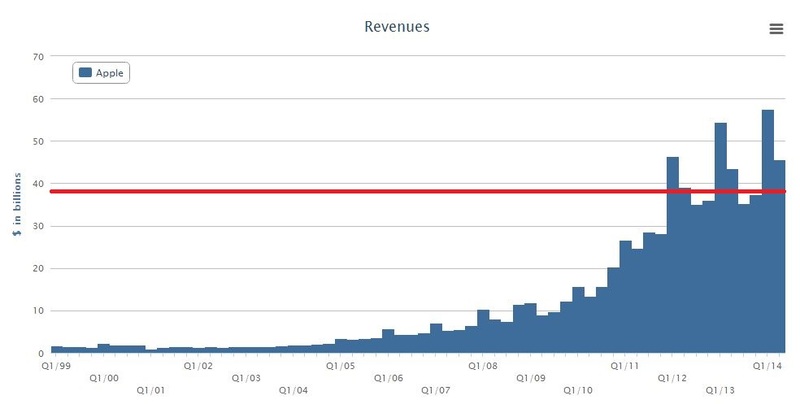 Too keep that in perspective, $38 billion is the red line in this chart of Apple’s recent quarterly revenue numbers. Last quarter, Apple announced an 8% dividend hike and a 30% buyback hike. It might be too soon to expect another large boost to either of those numbers only one quarter later, but even small increases in either of those numbers would be a good thing for shareholders. The emergence of the iWatch has been a topic of great debate for years now among Apple enthusiasts. Personally, I am skeptical of the mass appeal of a smart-watch. But any news about this gadget or any other potential new market for Apple would be a major event for shareholders. But product news is not the only surprise news item that could be announced, as news of the recent 7:1 stock split seemed to take everyone by surprise last quarter. After all, share price is what determines what our stakes are worth. 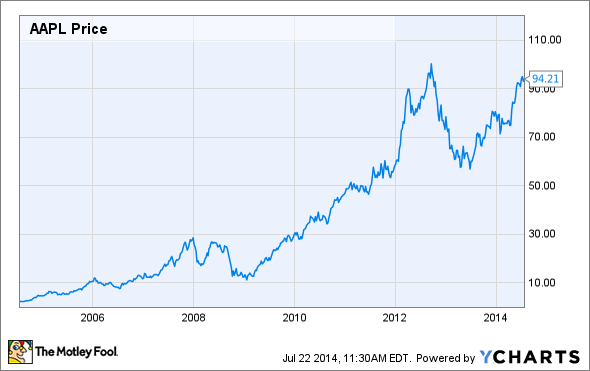 Apple is my largest stock holding, and the stock has done really well lately. Apple is up 24% in the past three months and 54% in the past year. And believe it or not, that’s not necessarily a good thing when it comes to catalysts such as earnings dates. When stocks have large run-ups in share price prior to earnings, traders sitting on big profits tend to get jittery and feel the urge to book their profits so as to avoid getting burned by potentially bad earnings numbers. These types of traders will feel pressured to sell today before earnings come out. The other type of sellers are traders who are sitting on large profits but want to wait for earnings to come out before they cash out because they don’t want to miss a potential good earnings report. This is the “sell the news” crowd, and they will sell immediately after earnings come out no matter how good or bad the numbers are. I’m not expecting a lot of excitement surrounding Apple’s earnings this time. I laid out my reasons for buying and holding Apple several months ago, and all of those reasons remain valid. Although if the Wall Street Journal article suggesting that Apple has ordered a whopping 80 million iPhone 6s from suppliers turns out to be a true indicator of what shareholders can expect from the launch of the new iPhone later this year, then there is yet another reason to continue to be excited about Apple’s future. I plan on revisiting these topics tomorrow after the actual numbers are released, so stay tuned! I want to take a minute to thank all the people that bought my book this past weekend while it was on sale. I hope you enjoy reading. Want to know what the “sell the news” crowd is? Or maybe you just want to be able to look sophisticated in front of your coworkers when they ask you what you are reading on your Kindle, and you’d prefer to tell them “Oh, I’m just reading a book about stock market analysis,” rather than the usual “Oh, I’m just looking at pics of my ex-girlfriend on Facebook.” For these reasons and more, check out my book, Beating Wall Street with Common Sense. I don’t have a degree in finance; I have a degree in neuroscience. You don’t have to predict what stocks will do if you can predict what traders will do and be one step ahead of them. I made a 400% return in the stock market over five years using only basic principles of psychology and common sense. Beating Wall Street with Common Sense is now available on Amazon, and tradingcommonsense.com is always available on your local internet!